Designing Coins, How Hard Could it Be? We are giving away a FREE 2012-W Proof Silver Eagle in a Special PCGS Holder with a Retail value of $75 to one of our readers. The Winner is Anthony DeCristofaro from Connecticut. Please send us an email if you are the winner to claim your prize. As always let us know how you are enjoying the PCGS Newsletter. How Many of Your Coins Do You Sell in a Year (More or Less)? The 1932-D is by far the rarest of the Washington quarters. There are only two Washington quarters with mintages of fewer than one million coins. The 1932-D has an original mintage of 436,800 coins and the 1932-S has a mintage of 408,000 coins. 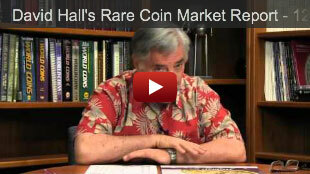 Both coins have been highly sought after in all grades for the past 60 years. We wrap up our two-part examination of PCGS' latest Registry Set, the “Civil War Set, Circulation Strikes (1861-1865)”, by focusing on the years 1863-1865. If you didn't get a chance to read Part One, or would like a refresher, you can find it here. In our last eCollector, we discussed telling the difference between a weak strike and wear on a coin. Even though in terms of visible detail, worn and weakly struck coins bear some resemblance, the color of the flat areas and the amount of luster covering the surface will help distinguish a worn coin from a weakly struck coin. With a New Year comes a new set of PCGS Members Only Show dates. In 2013, PCGS will host seven shows in Las Vegas, NV. The host hotel will be either Bellagio or The Venetian|The Palazzo. Review the dates now to see which shows you will attend. Additional show details, including hotel reservations for January 2013 are available at www.pcgs.com/MembersOnlySchedule. We look forward to seeing you throughout the year in Las Vegas at the PCGS Members Only Show! Designing Coins - How Hard Could it Be? I think the first time I designed a coin was when I was 12 years old in 1992, when there was a contest to design a $1 coin for Canada's quasquicentennial (125th anniversary). My submission, as I recall, was every provincial and territorial flag flowing over Niagara Falls. I never heard back from the mint. American colonial coins have long been a series for the connoisseur. It's a field shaped in the public consciousness by R. S. Yeoman's seminal A Guide Book of United States Coins, and one for which there is no substitute for years of study and first-hand experience. So You Think You Can Grade? PCGS holds grading contests at every January FUN Show, the Long Beach Expo (three times a year), and the summer ANA convention. The next contest will be held at the upcoming FUN show, Orlando, January 10-12.